One of the most important tests for identifying a mineral is determining its hardness. After we determine the luster of a mineral, hardness is the test we use to narrow down the possible choices. Mineral specimens can be just as sharp as broken glass. Be careful, and be safe. This test involves scratching the mineral. Be very careful not to damage delicate or expensive specimens. Lets start by looking at a nail and a glass jar. Which is harder? If we were talking about breaking things, then the nail would be harder to break, but here, we are talking about minerals and hardness. Instead of measuring how much force it takes to break them, we will be measuring how much they resist being cut or scratched. Use the point of the nail and try to scratch the glass. The glass is not scratched, because it is harder than the nail. How much harder? For that, we need some sort of scale for measuring. If you have a piece of the mineral quartz, start with it. A rounded, polished piece of quartz will not work well for this test. You want a piece that has an edge or point that you can use to try to scratch the glass. Holding it firmly, press the point of the quartz against the glass, and try to make a scratch. Press just a little harder than you would if you were drawing the mark with a pencil. Remember, you are trying to scratch the glass, not break it. You should hear a grating sound, and you should see a scratch on the glass. If you rub your finger over the scratch, it will not rub off. Quartz (hardness 7) is harder than glass (5.5), so it will scratch the glass. At this point, you may be remembering some TV program where someone identified a diamond by using it to scratch glass. Is that really a good way to identify a diamond? No. Any mineral that is harder than 5.5 will cut glass, and there are hundreds of minerals that are harder than 5.5. Next, try the same thing with a piece of calcite. Using an edge or point, try scratching the glass with the calcite. It may leave a mark, but you will find that the mark rubs off. With a hardness of 3, calcite is softer than glass (5.5), so it does not leave a scratch. The penny and the calcite have the same hardness. Set the glass aside, and pick up a penny. Try scratching the penny with the calcite. You should find that the calcite will leave scratches in the penny, which means that the calcite is harder than the penny, right? Well, not so fast. 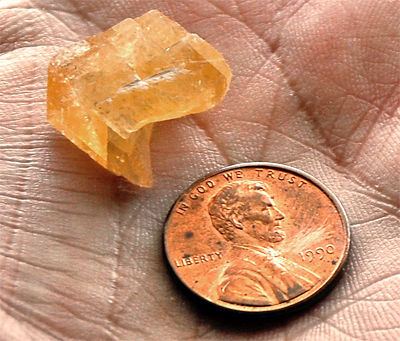 Use the penny to try to scratch the calcite. Remember, you are not trying to break it. Instead, use the edge of the penny to make a scratch. You should find that the penny will scratch the calcite. Always rub your finger across the scratch, to be sure that it does not rub away. Soft minerals can sometimes leave a streak that looks like a scratch. As your mineral collection grows, be sure to collect some "less than perfect" specimens from the Mohs Hardness Scale. A substance that scratches orthoclase, but not quartz will have a hardness between 6 and 7, but you won't want to scratch up your best specimens. Having some low quality specimens from the Mohs scale can make your hardness testing much more accurate. You should also try to collect some "less that perfect" specimens of unknown minerals. That perfect crystal you found will not look so perfect if it is scratched to test for hardness. Other tests may cause even more damage, so get plenty of extra pieces to use for testing, leaving your best specimens in perfect condition.